Fish! 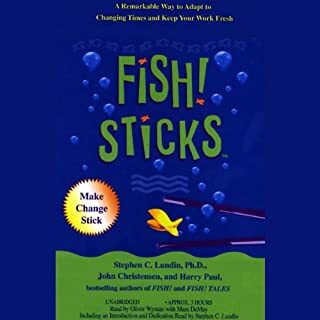 Sticks employs the same kind of easy-to-use story that was used in Fish! to illustrate its three main commitments for continued success: Find IT, Live IT, Coach IT, where the "IT" is each employee's own personal vision, found within the overall vision for the business. 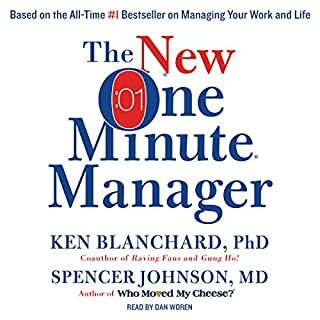 Chock full of easy-to-grasp examples, this book provides advice that is concrete and can produce immediate improvements in employee morale, customer satisfaction, and productivity, both for the short and long-term. Here's a brilliant parable for everyone who wants to lead a fuller, happier life. Millions of business people have already used the best-selling FISH! 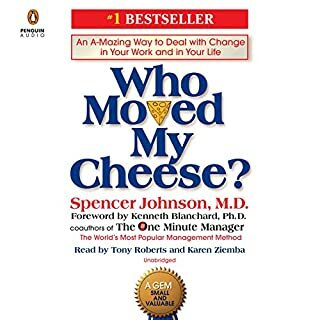 books to improve the way they work. 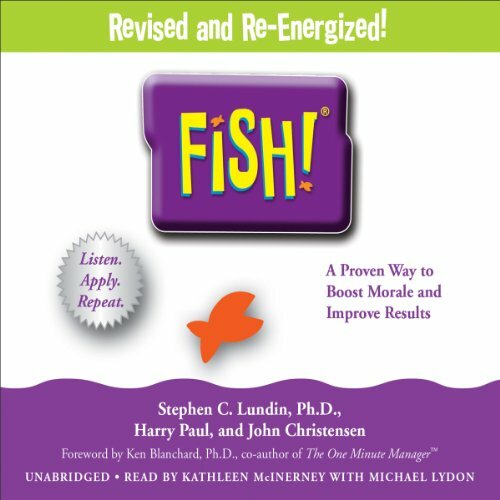 Now, the authors turn their attention to life's daily personal challenges, helping listeners deal with them simply and effectively. By applying the FISH! principles of Play, Make Their Day, Choose Your Attitude, and Be Present, FISH! For Life shows readers how to confront life's issues and to reach their full potential. FISH! is the remarkable story of what happens when Mary Jane seeks the help of these unlikely business "experts" and learns their secret: Four simple practices that, when applied daily, help anyone to be more energized, effective, and fulfilled. 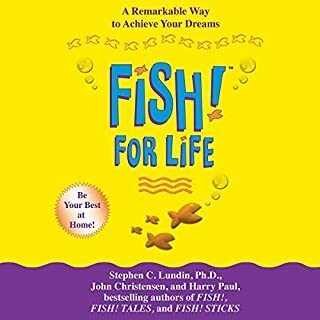 Filled with inspiration and timeless wisdom that will resonate with anyone in any field or career level, it's easy to see why FISH! is one of the most popular business parables of all time. People in organizations around the world use its practical lessons to improve customer service, build trust and teamwork, bolster leadership, and increase employee satisfaction. They also use the lessons to strengthen personal relationships, fulfill lifelong dreams, and realize their ambitions. FISH! will help you discover the amazing power that is already inside you to make a positive difference-wherever you are in life. 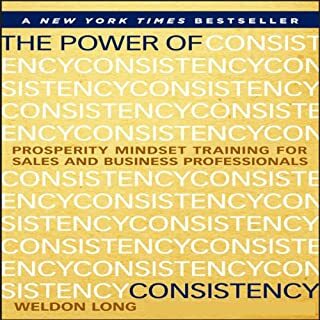 Based on a best-selling ChartHouse training video which has been adopted by corporations including Southwest Airlines, Sprint, and Nordstrom. We will implement this in our business. Great simple outline. Very direct but entertaining. Well written. So many of us forget the level of control we have over our attitude and how that in turn impacts how we are perceived and how we ourselves perceive others, which in turn greatly impacts our overall happiness. A mentor suggested the book. I wanted to finish it quickly and with my hectic life, I really didn't have time to read...but I could listen. I remembered that Amazon had suggested this app to me before because I am an avid Amazon buyer. I am glad I chose this for my first "read". The narrator had a great voice. I liked how she made her voice deeper to indicate men or others voices. The storyline reminded me of my own work environment and how my current leadership turned our department around. In less than 3 years we went from "ugh them" to "awww them". We have what we call Laughter Hour. When we don't have it, the other departments around us ask us what's going on. We have seen tremendous revenue growth. And as I said, I see a lot of the concepts from this recording in our team. I will certainly recommend that we all listen to this to look for areas to grow more. 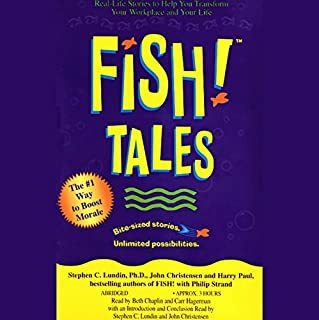 Thanks Audible for teaching us how to Fish! Reading a book is one thing but, listening to this book was amazing. Helps to bring the characters to life and enjoy a great read while being able to multitask. I was honestly shocked by this book. I thought that I would dread having someone read me a book, but I loved it! I was expecting a monotoned reader, but I received an engaged reader who had many different tones. Along with multiple readers. I read the first 20 pages of the book and i got 10 times more out of her reading it to me than reading it myself. Fun book about bringing fun to the work place. I'll definitely be bringing some of these practices to the team. When I heard about the concept I was a little bit sceptical. But going through the book I realised how amazing this concept is. Created in a though working environment, fish philosophy is one of it's kind, life changing way of seeing the world. Superb! It was just what I needed. it was so inspiring. I will definitely read it again!